I am a research faculty member of the University of Colorado at Boulder. I design and develop software used in spacecraft observations of the Sun. I have an undergraduate degree in physics, a Masters degree in Earth and Planetary Science, and a Ph.D. in geophysics. Unlike most Ph.D.'s that you may know, I actually have a job that doesn't involve Avon products. I love to travel, and my travel photos and journals form much of the content of this website. In addition to passport stamps and university degrees, I also collect coins and Boston Terriers. 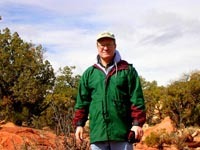 I am fascinated by the geology of the western US, particularly that of my home state of Colorado, and my wife, Carolyn, and I enjoy ballroom dancing. If you discovered this website while browsing the internet, you are not alone. SteveMueller.com receives between 500 and 800 unique visitors per day. Most are search engine referrals with Boston Terriers and European travel destinations representing the most popular subjects. Although this site is targeted toward family and friends, anyone is welcome to browse.